Imagine running across a stage for nearly two hours every night, singing to thousands of screaming fans and working up a pretty decent sweat. For the Jonas Brothers, this is just a typical night and one heck of a cardio workout. 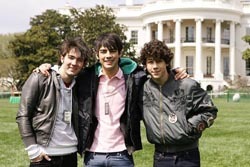 “You just feel great at the end of the night and when you wake up in the morning,” Kevin Jonas said at a recent stop with his brothers at the White House. The sibling trio was there to help encourage kids to be more active, and to talk about diabetes. The youngest sibling, Nick, has been diabetic since he was 13. They filmed a PSA encouraging kids to visit national parks and get plenty of exercise. HOW COME U GUYS NEVER VISIT JAMAICA IN THE CARIBBEAN? I HOPE U VISIT SOON BECAUSE I WILL REALLY LIKE TO MEET U HERE IS MY NUMBER CALL ME I AM A GIRL. It is great to see young people promoting fitness. I volunteer time to local schools to help our country’s future develop a “get fit” attitude. All too often I witness young individuals with a dismal future concerning their health and it breaks my heart. These young gentlemen are poised to bring fitness to a worldwide audience and promote health/wellness for generations to come. I commend them and wish them the best. Now I am persuaded to become a Jonas Brothers fan too and sing along with my daughters.